My sister and I were descending the hill from our rented tiny house (50$/night!!) above Nelson, B.C., when an indecipherable symbol lit up on my dashboard. It was either telling me that the car had to be tumble-dried on low, that this was a unisex bathroom, or that my wi-fi was still loading. A perusal of one of the six Harry Potter-size manuals that came with the car revealed that it actually had something to do with tire pressure. I knew the film ginger-haired Glen was referring to: Roxanne, the romantic comedy written and starred in by Steve Martin. The title character, played by Daryl Hannah, with her wavy, man-trap hair and slouchy boots, launched my lifelong desire to have a denim vest. I wish I could say my lifelong desire to be an astronomer, like her character… but no, no, just to wear a denim vest. By 1987, I had already earned a couple Cs in math, and I knew which way the wind was blowing. If you are going to dream big, you better pass geometry. “I was in the barn scene,” Glen went on, “But they fuzzed me oot.” I love Canadian accents, because I love everything Canadian, except poutine. “Should I watch it again and look for you? Or for the place where you were?” “No, no,” he said, with resigned good humor,“They fuzzed me oot, ya know.” Here it is, three decades later, and not just Glen, but the owner of the health food store, and everyone else I talked to, remembered the glorious months when the film crew was in town, putting their charming burgh – once a silver rush boom town – on the map for American moviegoers. If that sounds sad, or like the town is in a state of faded glory, it isn’t. Nelsonites know they are in a stunning corner of the world. I don’t know what it was like back in 1987, (when Steve Martin came into the health food store in search of a vegetarian hot dog – true story) but right now there are breweries and eateries a plenty. Going north? I recommend Cantina del Centro* and Yum Son, for delicious food, friendly staff, and attractive, fun, atmosphere. (It’s rare to get 3 out of 3 don’t you think? Oh, were you hoping for inexpensive too? That’s funny). But let’s talk baked goods. The Kootenay Bakery Cafe is a buttery chunk of heaven. The interior isn’t fancy, or particularly hip, but the ingredients are fresh, organic, and often local. The energy was pleasant, and the workers were very matter of fact when their wi-fi went away, leaving me unable to pay for the armload of pastries I had hoped to make off with. They were kind of like, “Hey, you are in the most beautiful place on earth, plus you don’t look like you are starving. I think you are going to be just fine,” but without being jerks about it. And I was! I was just fine! But only because after a fruitless search for a cash machine that spoke American, we came back the next day with credit cards again, the wi-fi was humming, and we had a redo. https://adventurehotel.ca/gallery/ The addition was built in 1939, but the original tower dates from the silver rush. Chocolate croissants! Savory pies! Potato frittatas! The frittatas were such a perfect size, (about 5 inches in diameter) that I had them show me the ingenious silicone pan they were made in. When kitchen staff bring out specialty pans for me to look at, I hear angels singing. There are so many choices at this bakery, you may find yourself wringing your hands. If I ever stay in Nelson again, (please!!) I will eat there twice daily for several days, until I feel I have sampled the bulk of their wares. As their city motto exhorts, “Forge Ahead!” I take that mandate seriously. P.S. It just occurred to me that Steve Martin made chocolate croissants in It’s complicated. In this romantic comedy, he stars opposite Meryl Streep, whose character is a successful pastry chef and patisserie owner. On their first date she takes him to her shop, after hours, and tells him she can make him anything he wants. Their pairing may be complicated, but unlike his with Hannah, it’s more age appropriate. I do still love Roxanne though, in spite of the predictable May-September match-up. *Thank you to the front desk manager at the very cool, recently renovated Adventure Hotel, for the tour, and the recommendation for Cantina del Centro. And thank you Uncle Frank, for seconding the recommendation. I know I am prone to gush about our neighbor to the north, but Eaters: look at the scenery! Oh Canada! Oops! I mean: Eaters, look at the scenery! The Valhalla Mountains and Slocan Lake, viewed from New Denver, B.C. My sister and I went on a mini-tour of the Kootenay region of B.C. and, just as I suspected, it’s a woodsy and mountainous wonderland with gobs of fresh air. The lakes are deep and chilly,* the residents are friendly, and there are lots of hot springs. Sadly, the gasoline and beer cost three prices, and we always seemed to be in dire need of both. But otherwise, it’s paradise. The Canadian border guard who eyed our passports and asked us if we had guns, gin, or cocaine** that we needed to fess up to, noted our last names and inquired if he sensed, “Sister trouble headed north.” Oh yes. Cut to our return from three nights in an adorable tiny home in Nelson, (more on Nelson next time) as we paused in postcard pretty Rossland, a ski town an hour north of the border. We asked a local where to get pastries and fortifying hot beverages, and she recommended Alpine Grind. I complimented her lovely town and she sighed happily, “We drove in 27 years ago and never left. I raised children in this town, and now my grandchildren are here.” I was tempted to do the same, but then remembered I was 47, with a family waiting back in the states. Too late for another life, but not too late for a pastry. The Alpine Grind was a cafe of surpassing deliciousness with a menu including a vegetable frittata pressed (Yes! PRESSED!) bagel sandwich that fairly groaned under the weight of so much cheese. Served with salsa, it was exactly what we needed at the outset of a 500 mile (804 kilometer!) journey home. After that filling breakfast, my sister and I each ordered a baked good to go, something we were unable to resist doing on this jaunt. “I am on vacation!” I kept telling myself, from deeper and deeper within my chins. It’s a good thing I don’t vacation more often. Their clouds are better; Justin sees to it. Yes, well, the man of my dreams was, at that very moment, back in Olympia with a congested and coughing daughter, and a similarly ailing dishwasher; I knew he was mightily weary of my wanderlust. Forget possible impregnation, I needed to get out before I used up my husband’s store of patience. I grabbed my scone and took flight, my sister on my heels, clutching her cinnamon roll. I will have more to say about baked goods and Canada – I usually do. So stay tuned to see if we made it back, or decided to stick around and stalk Justin Trudeau while bakery-hopping. *I asked a local where I could find a good place to swim and she said, “You can’t. By the end of summer the lake temperatures will be just up to…freezing.” That right there, is all the encouragement I require. **No, just mace, beer, and SSRIs. I wish this post’s title were original to me, but I swiped it from an episode of The Sporkful, Dan Pashman’s off-beat and inspiring podcast. I recently discovered this amazing food lover’s feast for the ears, and it is now the soundtrack of my every car ride. 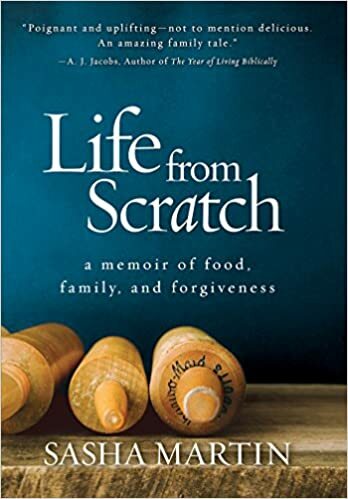 Here’s his tagline, “Every week we obsess about food, to learn more about people.” Pashman proclaims himself an Eater, which is, as you know, a distinction dear to my heart. I am not a trained chef, not a restaurant critic, and can’t afford to be a foodie (plus the foodies won’t have me because I still consider peanut butter the nectar of the gods). But boy, am I an Eater. These wise, liberating words about cake came from the eaterly lips of Yotam Ottelenghi, who was the guest on a recent episode. His cookbooks, including Plenty and Jerusalem, are visually thrilling. Even if you never make one of his dishes, just looking at the photographs makes you want to fondle an eggplant. He is also a fan of sweets, and the inventor of one of my very favorite, stunningly delicious (and deliciously stunning) desserts: the strawberry pomegranate and rose petal mess. I wrote about it here, and have made it many times since. 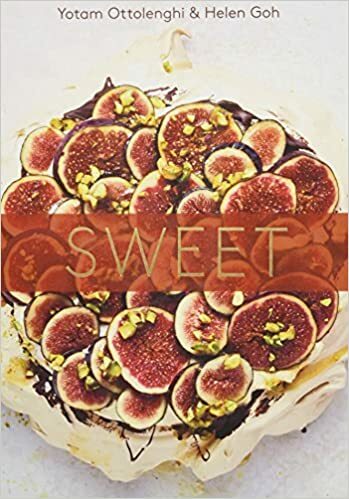 His new book, Sweet, just arrived in stores. Just a side note: he is fabulously easy on the eyes (and ears, with a voice like creamy butter). Never one to turn down a command, request, or gentle nudge to bake a cake, I got to it. I would love to say I followed Ottolenghi and Goh’s recipe for beet, ginger and sour cream cake to the letter, but as always, that would be a lie. First of all, I used carrots in place of beets. I had the perfect amount of grated carrots in my freezer, plus I can’t get used to beets in desserts, despite their brilliant coloring abilities. It called for 3/4 of a cup of sugar; I used 1/2. It called for sunflower oil; I used butter – and so on. It all came together to make a good carrot cake, complete with crystallized ginger and pineapple, (the latter was my addition) but it’s really the frosting I want to dwell on here. Cream cheese frosting is proof that God loves us, but with fresh ginger juice painstakingly squeezed in? Well, it’s clear God loves us more than we deserve. I was in enthusiastic agreement with Ottolengi’s idea that it’s better to enjoy a homemade slice of cake in the sustaining company of family and friends, than to waste your precious sugar quota on dispiriting granola bars, maneuvered into your face while you drive, or demoralizing Famous (not with me) Amos cookies. Yes, I am a sweets-snob, but that’s not news. So I was careful to eat no other dessert the day I made the cake. But then, due to the creamy, gingery frosting, (coupled with an inability to self-govern) I ate three pieces. Oh well, I will try to do better tomorrow, when I bake another cake. Place the cream cheese in the bowl of an electric mixer with the paddle attachment in place and beat (you may also use a hand mixer) until smooth (the amount of time this takes will vary). Add the confectioners’ sugar and beat until well incorporated. Add the cream and beat for about 1 minute, until the frosting is thick and smooth. Add the ginger juice, beat for a final few seconds. Slather on cooled cake.